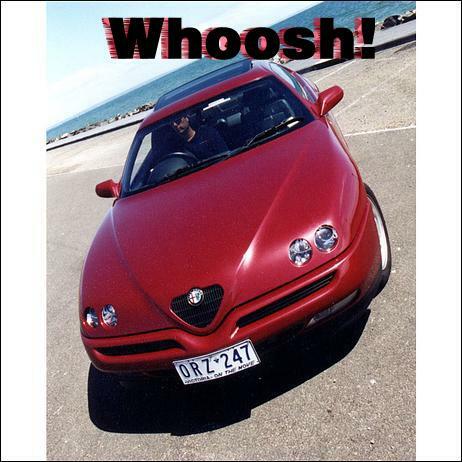 Huffing and puffing into an Alfa Romeo GTV 2 litre. The turbo kit from respected Alfa workshop Benincas transforms the already sweet Alfa four into a turbo powerhouse! You'll find around thirty per cent more power and simply superb mid-range grunt from the roller bearing, intercooled Garret turbo. The DOHC 2 litre four found under the bonnet of the current Spider, 156 and GTV is certainly no powder-puff. With 114kW and 186Nm it pushes the smaller Alfas around with respectable performance - 0-100 in 9.4 secs in the case of the GTV. It's a torquey, creamy-smooth engine, its variable valve timing giving excellent low-down response in addition to allowing power to still peak high. All in all, it's a pretty good engine - as so it should be, it's only been around for a few years! But all of that is so much Alfa Romeo propaganda to the guys at the Beninca workshop, in Melbourne. An Alfa specialist for many, many years, Benincas know Alfas - and they also know all about power. From fielding a Porsche in GTP (and winning the championship) to running an awesome turbocharged sports sedan a few years ago, these blokes know what a good push in the back feels like it. And, despite the publicity hyperbole, with the GTV they weren't getting it. It wasn't there, they even decided, in the 3 litre V6 version. After considering the options, they decided to develop a turbo kit for the 2 litre four; nothing too radical - no lowering of the comp ratio, no internal mods - but a bolt-on kit that nonetheless would give a considerable increase in power. With about 32 per cent more power on 7-psi boost, they certainly achieved that! "With the old two litre engine," the guys recounted, "you wouldn't have got out of the gate if we'd bolted a turbo onto the engine's exhaust manifold. It'd have fallen off with all of the vibration!" The reason for this philosophising was the appearance of a casting in front of us, an elbow designed to allow the new roller bearing Garret to bolt straight to the standard tubular, stainless steel exhaust manifold used on the current engine. Since the runner lengths are ideally suited to turbocharging - and since the balance shaft engine is as smooth as silk - use was made of the original manifold. In the past, Benincas have cast up plenty of turbo exhaust manifolds for Alfa engines, so the ability was certainly there if such a product had been needed. But this time it wasn't. The turbo is therefore damn' near invisible, hiding well below the factory heat shield. In fact, it's only the plumbing to and from it that can be seen. Some of this plumbing connects the compressor outlet to a hefty (about 7M-GTE Supra-sized) air/air intercooler core that lurks behind the grille. With the standard 10:1 comp ratio still remaining, keeping the intake air cool has obvious benefits in reducing the chance of detonation, in addition to improving power still further. The original airbox, air filter and airflow meter all remain in place with, at this stage, the metal plumbing made from welded mild steel bends. A Bosch throttle-closed blow-off valve is used, while on the other side of the turbine, a standard exhaust (featuring only a revised muffler) is retained. The Beninca workshop is the only aftermarket workshop that I have ever visited that has an engine dyno, a chassis dyno - and the expertise to re-write engine management chips in-house. And with some of the crew boasting tertiary qualifications in engineering and electronics, the manipulation of the software is carried out from an informed perspective and is also able to be tested with accuracy. The GTV Turbo runs a re-mapped factory engine management system, with the program modifications concentrating on pulling out timing at high loads and with high intake air temps (intake air temp is measured by the standard sensor mounted in a revised location), making sure that the larger than standard injectors give the appropriate mixtures, and moving the limp-home values to higher limits. The latter means that the ECU doesn't think that there's a fault condition present when the airflow meter shows much higher than standard flows, for example. In addition to the larger injectors, a new high pressure fuel pump has been installed in the tank. But that's it for engine management mods - no rising rate fuel pressure regulator was deemed necessary. Development of the chip cracking techniques involved the use of a complete GTV loom and ECU mounted on the bench. Resistors were used to simulate sensors and LEDs the outputs (like the injectors). The guys even built a programmable pulse generator to allow the input of the specific crank trigger waveform. We had the turbo GTV for a full day and were highly impressed. As with any turbo engine using a high compression ratio and a well-matched turbo, power builds very progressively. The 'coming on cam' sensation of the standard engine is retained - but this time it's coming on boost as well! Mid-range is superbly strong, with the power curve well maintained right through to the redline. And although we tried our damnest to make it detonate, on the car's normal premium unleaded fuel and in the relatively cool conditions of the test day, there were definitely no ting-tings present. The test car was an early import - brought in even before official sales began - and it had a few peculiarities. One was that the tyres felt very hard - and so slippery. In damp conditions the car would very rapidly change from power understeer to lift-off oversteer - a trait that although present, was certainly not as severe in the similar chassis Spider that AutoSpeed tested ("New Car Test - Alfa Romeo Spider TwinSpark"). This may help to explain the pronounced torque steer that was present in the lower gears. Benincas told us that when the tyres were fresher, the car didn't torque steer noticeably at all - but they acknowledged that it does now! In fact, standing on the loud pedal in first gear with your hands off the wheel gave a very right-hand quick lane change... and that in dry conditions. However the capability of the chassis is high, and if the car is driven as a powerful front wheel drive, it's unlikely to get away. Independent testing has yielded performance times as quick as 6.9 seconds for the 0-100 sprint, and - while it didn't feel quite that quick when we drove it - Beninca's own low seven second test times felt about right. The quarter is despatched in the low fifteens, taking the turbo GTV to an entirely different class of performance to the standard car. The turbo conversion adds a major new dimension to the GTV (and, we imagine, also the Spider and the 156): serious performance. For the A$9000 kit cost we'd like to see cast alloy intake pipes rather than the fabricated mild steel ones used on the prototype, but in terms of a highly competent conversion, you need look no further. This car has power to burn.